I’m super excited to share that this weekend only you can get a great book at a huge discount. Get the eBook version for $1.99 (reg. $13.99) through 7/19. You can read it on any device or computer. I got a copy of this book last year and read it over a couple days. 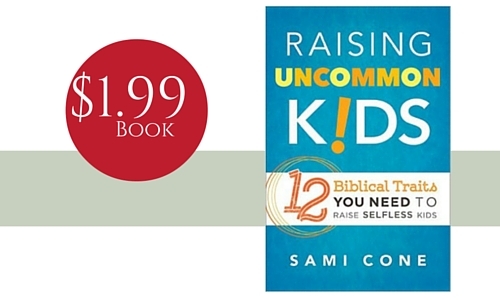 Raising Uncommon Kids an easy read, but I’ll warn you it’s a eye opening book that isn’t so much about shaping your kids but examining your ow heart! You’ll be encouraged and pricked a little to lead as an example the traits that you want to see in your kids. It’s definitely $1.99 well spent and will hopefully be as much of encouragement to you as it was to me.